. Item Description You are viewing an Infant Shorty Wetsuit. These Blue Rush Toddler Wetsuits feature a low crew neck for comfort. Also available are cuts to suit Men, Ladies and Juniors. 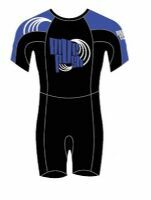 Our Blue Rush wetsuits use quality neoprene and feature a strong Y.K.K. rear zip with cord. Wetsuits are constructed with compression flat lock stitching for added strength of seams.